Many a nurse found in violation of nursing regulations have come to me saying, “I didn’t know I couldn’t do that!” Other times I hear, “Well, that’s the way we did it in our unit” or “That’s how I was trained!” But none of those are proper defenses to charges that could be applied to your license. You are responsible for knowing the rules that you are required to follow. If you don’t know, you have an obligation to find out. Even if you think you know, but your thinking is incorrect, you’re still responsible! Here’s an example. 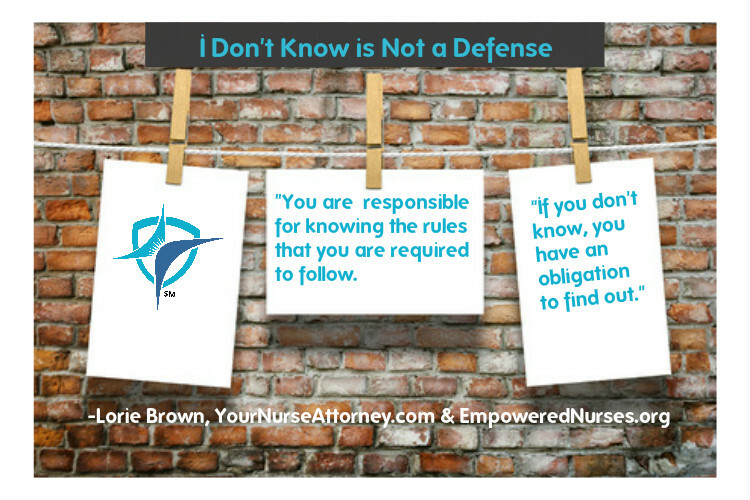 On your license renewal, you are required to answer the question: “Have you been disciplined, reprimanded or terminated in your capacity as a health care provider?” Sometimes nurses omit cases of disciplinary action because they think they’re insignificant. But the Board even considers discipline for errors such as attendance or educational teaching as something for which you must answer that question with a “yes.” No matter how minor or insignificant the form or circumstances of discipline may be, you must disclose them to the Board. Honesty is the best policy when answering these questions. Another issue arises with the question, “Have you been arrested, charged or convicted of a crime or pled no contest?” Many health care providers think they don’t need to report charges that were dropped or led to no conviction. However, the question is clear: All charges, even if dismissed, must be disclosed. Accidental violations of general practices can be problematic as well. Here are a few common examples I see. Sometimes one person in a nursing unit, especially on the night shift, prepares all the meds (bagging, getting them ready for the patients) and a different person administers those meds. Although this division of labor saves time, it violates the Five Rights of Medication Administration. Sometimes when a patient arrives at the ER with abdominal pain, but the physician is too busy at the moment to see that patient, nurses get started right away setting up an IV, getting a flat plate of the abdomen, and drawing labs. However, you cannot begin any of these without a physician’s order. Sometimes when a patient’s medication is not in the drawer you borrow the same medication from another patient to give to the first on schedule. Even though everyone gets the same medication in the end, administering one patient’s medication to another is considered theft. These examples may seem trivial, but they violate nursing regulations and can land you and your license in trouble. It’s hard to know what you don’t now. And it may be inconvenient or embarrassing to ask questions about something that you don’t know or don’t know if you don’t know. But when in doubt … ask. Your license is too important not to. And when you do, be sure you’re asking someone qualified to answer. If you call and ask the Nursing Board, for example, you may find yourself speaking to a clerk who of course can’t be expected to provide the correct answer. Find a trustworthy source you can comfortably confide in and the keep administering the care and love you have for years with your license secure.